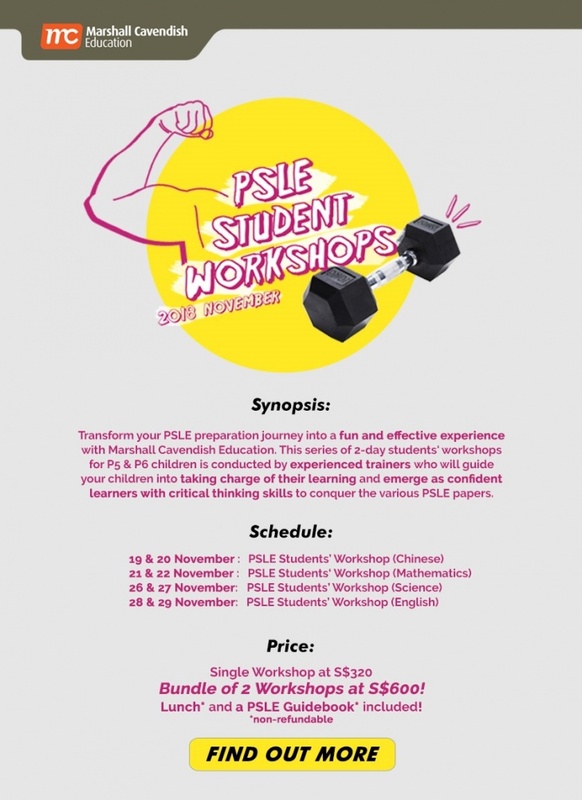 Kickstart your PSLE preparation with Marshall Cavendish Education (MCE) this November! MCE is conducting a series of workshops for Primary Five (in 2019) students and their parents to prepare their children for the national examinations. Embark on a fun learning journey of tips, tricks and tactics to score in the PSLE with the leading holistic educational solutions provider. PSLE Parents’ Workshop: Be your child’s #1 cheerleader! The series of one-day MCE Parents' workshops will equip parents with practical and effective strategies to manage exam preparation jitters. Subject experts with over 10 years of teaching experience will delve into the curriculum topics of each subject to help parents understand outcomes of the national exam and key focus areas of the various subjects to be able to coach their children using effective learning strategies. PSLE Students’ Workshop: It is time to get to work! The series of two-day MCE Students' workshops for P5 children is conducted by experienced trainers who will guide students into taking charge of their learning and emerge as confident learners with critical thinking skills to conquer the various PSLE papers. Pick up strategies and skills to confidently tackle the different components in the English papers. Learn ways to improve command of the Chinese language. Decipher higher-order thinking questions to simply and effectively solve the different Maths problems. Study smart with techniques to answering various Science questions.